Bob Bonham and Kenny Kassel have been staging the Women's Extravaganza for a number of years. On October 2nd, they created their first IFBB sanctioned pro bodybuilding competition for women, along with a fitness strength contest. 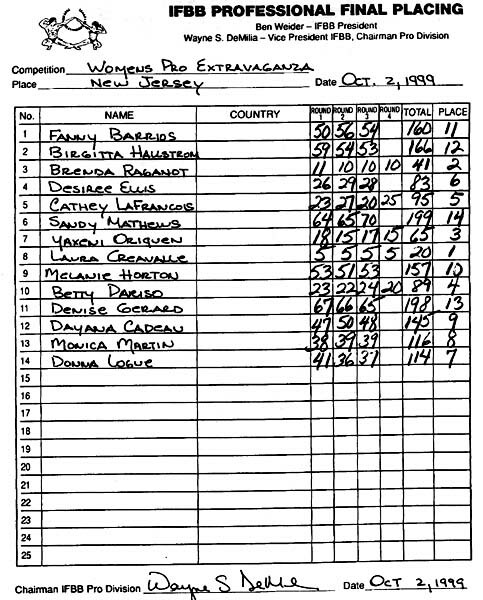 The event was somewhat overshadowed by the last minute addition of the rescheduled Ms. Olympia contest to the program, but the three top finishers in the Extravaganza in the afternoon qualified to enter the Ms. Olympia, which was held in the evening. Laura Creavalle was the convincing winner of the Pro Extravaganza, which is no suprise given that she went on to place third in the Ms. Olympia. Laura is won of the real veterans of the sport and it showed - her physique was not only sleek, muscular and refined but her poise and presentation were absolutely first-rate.